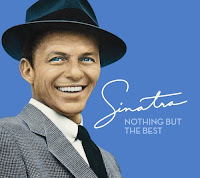 There's something about Frank Sinatra that makes me just unravel and feel magnificent, the moment I hear his marvelous voice. I'm on this project that requires endless bursts of creativity and just when I was running low on color combination, typography and composition fuel, Mr. Sinatra took me on a 4 minute and 29 second trip to New York and it was beautiful. Where's a glass of Chiraz when you need one? I'll be catching you all up on recent trips, festivities, amazing noms and b.day adventures... with doses of more noms and sports of course. Till then, let's step away for a few minutes.